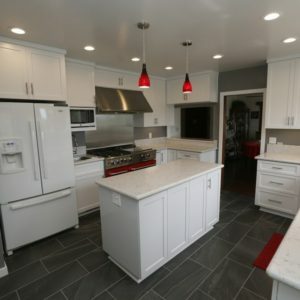 Depending on the scope of your project,Kitchen remodeling in Monrovia CA has the potential to involve many challenging tasks, from installing perfectly level countertops and cabinets to rerouting plumbing and gas lines. Naturally, you need an experienced contractor like Cabinet Magic to make your project a success. Cabinet Magic offers the quality construction and installation services you expect from a licensed contractor, along with excellent prices on designer products and as much or as little design assistance as you may require. Going for a bold new look with kitchen remodeling in Monrovia CA can be exhilarating. But you may also feel a little bit worried. For example, you may worry that your flooring and countertop won’t complement one another like you’d hoped, or that the color you’ve chosen for your cabinets will be too dark once a whole wall of cabinetry is installed. At Cabinet Magic, we believe being able to accurately visualize your kitchen remodeling in Monrovia CA before work begins is key to being satisfied with the final result. That’s why we always bring proposed kitchen designs to life using 3D rendering software. We’re happy to create multiple versions of the design so you can easily compare different options. We never begin work without your sign off and approval of every detail of the design. Most people opt for custom cabinetry because they want a truly unique look with cabinets perfectly suited to their style and their space. But custom cabinetry also delivers another very important benefit: custom functionality. You can trust Cabinet Magic with your custom cabinetry because we have nearly 3 decades of experience in this specialty service. No decorative detail or cabinet accessory is too difficult for our talented craftsmen. We are true perfectionists and we take great pride in delivering quality cabinetry that lasts. Would you like more information about working with Cabinet Magic on your kitchen remodeling in Monrovia CA? Call us at 800-828-4380 or contact us online to schedule a free in home consultation. We’ll be happy to share ideas and provide a free estimate for the project.